Rowing Machine utilizes the technique of rowing that is a favorite and popular water activity among people who love water sports. During rowing, various important sets of muscles are required to perform vigorous movements. 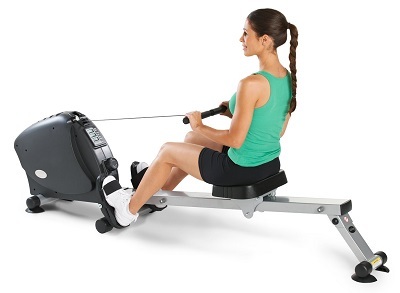 Rowing machines are used to tone the muscles of abdomen, arms, shoulders, legs, back and buttocks. Working out on a rowing machine is also beneficial for the health of lungs, heart and circulatory system. Rowing machine benefits us a lot. It helps in toning the major muscle groups of both the upper and lower parts of the body. Hence, it is ideal for people who are very busy and do not have much time to exercise. Tone Muscles. One of the important rowing machine benefits is that it can tone our muscles. As already stated, rowing machine helps tone a large set of muscles of both the upper and lower parts of the body. While performing a rowing machine exercise, the muscles of thighs, hips, pelvis and torso have to make a significant effort. Moreover, the muscles of the upper body including that of the shoulders and forearms have to work against a significant amount of resistance. Hence, the muscles of the whole body get toned. Rowing machine exercise also helps in the strengthening of the abdominal muscles. To some extent the muscles of the calf also get build up by working on a rowing machine. Help with Cardio Exercises. According to health experts, exercising on a rowing machine burns more calories in comparison to exercising on other machines such as an elliptical trainer or a treadmill. Thus you will be burning more calories in the short duration while exercising on a rowing machine. This happens because during a rowing machine exercise your whole body is moving constantly making the heart to pump blood faster to meet the body's increased demands of oxygen. This helps in improving heart health and reduces the risk of development of various lifestyle diseases such as diabetes, hypertension, stroke and coronary artery disease. Rowing also helps in increasing your lung capacity by opening them up so as to supply the increased oxygen required by the body. Save Time. Rowing machine provides great total body work out for individuals who are busy and do not have enough time to go the gym regularly. Hence, it proves to be an excellent investment to have a rowing machine in your home gym. Exercising on rowing machine gives a total body work out in a short duration of time and is efficient in burning more calories in comparison to other machines such as a treadmill or an elliptical trainer. Hence, you can get rid of your excess weight and fat by exercising on rowing machine in combination with following a healthy dietary and sleeping regimen. Burn Calories. Exercising on a rowing machine burns approximately 800 calories per hour depending on the type of rowing machine used and the intensity of the work out. You can set the resistance level of the rowing machine according to your exercising capacity. Beginners are recommended to focus more on posture and technique initially and with time and practice they can increase their speed and resistance. Offer High-Intensity but Low-Impact Workout. Most of the exercise machines used in a gym may cause joint problems in individuals using them. However, the design of a modern rowing machine is such that it provides high intensity work out of almost all the muscles and joints of the body without causing any major impact on them. If you follow the instructions given in the instruction manual of your machine diligently, you do not have to worry about any injury being caused to your knee or ankle joints. Ease Body and Mind. It is a normal tendency of any individual to miss his/her workout routine in case he/she is stressed out. However, during times of stress, if you hit your rowing machine for an exercise session, you will feel that at the end of this session your stress level has gone down. This happens because during an exercise session on rowing machine, you have to focus on correct posture and movement, so that the pressure is put on the appropriate muscles. This causes your mind to divert from the stress you are feeling. Moreover, the momentum caused by the exercise increases the blood circulation and releases stress and puts both your mind and body at ease. The major drawback of using a rowing machine is that it may cause problem in your back region, especially lower back. Hence, exercising on a rowing machine is not recommended in individuals who suffer from spine or lower back problems such as low back pain. You need to have expertise while exercising on a rowing machine. As an amateur you have the risk of injuring your muscles, in case you are not using the proper technique of exercising on a rowing machine. You may find it difficult to assemble the parts of a rowing machine in case you have bought one for your home gym.